I am a complete lover of Autumn/Winter, it is my favourite time of the year. Other than the obvious Christmas, I love it for the weather. I love coming in from the cold weather and getting all cosy, one thing that helps me with that is a good old fashion pamper night. I actually don't need an excuse to stay in the bathroom for hours, but a pamper evening is definitely up there. First, things first on a pamper night is a warm bubble bath, this is on your number one to do list. With the weather so cold having a warm bath really helps get you toasty. I have been loving Zoella Merry and Bright Bubble Bath recently, it gives the best bubbles and smells so fresh. Watching your fav tv show gives you an even better excuse to lay in the bath for a long time. How many eps can you fit in before I get yelled at for hogging the bath is a little game I like to play. I have been watching Riverdale but I also binged the hell of Stranger things. Even better, stick on a facemask and just relax. I love this Tea Tree and Witch Hazel Peel Off mask from boots, it makes my face feel nice and refreshed. I also love cleansing my face, I'll do this both in the bath and when I am out, I am obsessed with Soap and Glory's Peaches and Clean. Something simple like washing my hair is perfect for me on a Pamper evening, I find it such an effort to wash my hair, dry shampoo all the way, however, washing my hair and then drying it can make me feel so restored and ready for my bed. Ever since I used it in America, I have been loving John Frieda's, Sheer Blonde. Cleaning yourself has to happen, get some of your favourite bath products and indulge. Snow Fairy at this time of year gives me so many feels, it creates insane bubbles but also makes you smell so sweet and Wintery. I always exfoliate on my pamper nights, it is something that I just forget to do on a daily basis, however, on a special night I love it. I have a few things that I love, Zoella 'Scrubbing me Softly is' one of my fav products she has come out with. It makes my skin feel so soft and smooth, it does remind me a lot of Summer so I tend not to use it that often. If I want something fresh smelling then I go with my Pink body scrub, it is less oily than the Zoella scrub but it still makes my skin feel so soft and clean. I have recently been reaching for this *Joan Collins Dry Oil Body Polish*. This literally smells like a Spa. It is quite floral, and actually reminds me a lot of the Disneyland Hotel in Paris, very posh and feels like a luxury. It is very light on my skin and like the others makes me feel so clean. Last but not least moisturising, I actually have many body lotions but my all times favourite is the Soap and Glory Righteous Butter. I love moisturising my whole body and then putting on thick cosy PJs and thick socks. I am then 100% ready for bed. Let me know what you do a Pamper night? Girl your PHOTOS! I'd love to take photos like this by my bath but honestly, the walls look gross haha. Some serious editing would have to be done. I haven't tried any of Zoella's products yet but I've heard great things. I love the smell of Snow Fairy too! Oh my goodness how pleasing does this al sound - in desperate need of a good hot bath now and it’s Thuraday, so a catch up of Riverdale is needed! Your photos make me want to have a bath now. :) They're very nice and the products you listed look great. Thanks for the post! I am so gonna have one of these next week once lots of work is out the way! Ooohhh Emma your photos have left me feeling so cosy! A candle is also an essential for me and I've been loving cinnamon scents this year, there's nothing like a homely smell to warm you up on a cold winter's day! The tea tree peel off mask sounds fab as well, tea tree always works wonders for my skin! I really want to have a pamper night now, must make time for one this week! Ahhhhh, I wish i had a bath so much! It's my only conition about our new house next year, it MUST have a bath! That Joan Collins scrub looks amazing!! 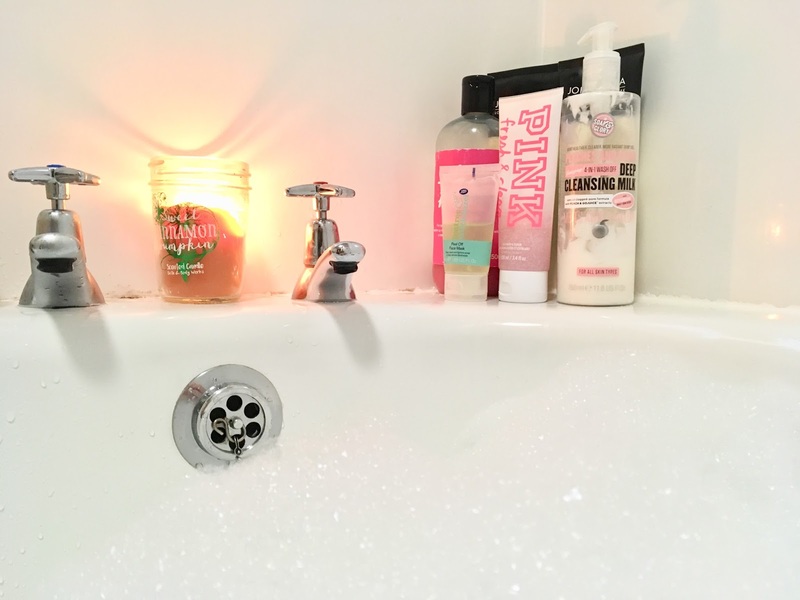 I love a cosy hot bubble bath with some of my fave bath, body and skincare products! I never leave my candles on the edge of the bath either, such risky business haha! I just watched the last episode of river dale & I'm so annoyed at jughead for kissing tonI! also who do you think the black hood is? I'm guessing betty's brother!